Playing For Change has been bringing the world together through music for over a decade. 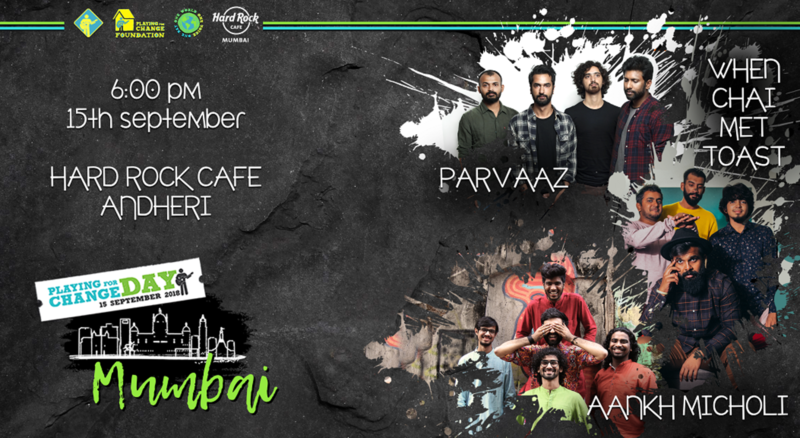 Collaborating with artists across the globe, their movement has touched the lives of many through the works of PARVAAZ, When Chai Met Toast, Aankh Micholi & others will be performing at Playing For Change Day Mumbai! On September 15th, they come together to join the Playing For Change Day movement, a global celebration in India for the first time this year. Join them at Hard Rock Cafe, Andheri on Saturday 15th September from 6 PM for epic performances that aid the Playing For Change Foundation in changing the world, one song at a time. A contemporary Indian music band, the magical confluence of each member's background & individually assimilated international progressive/psychedic rock influences leaves a unique sound. Named "India's Most Exciting Band" by the Rolling Stone, their distinctive Kashmiri & Urdu touch have ensured their return to India's biggest music stages year after year. From the land of coconuts, this band brings their infectiously happy music to inspire and connect people. Their music transcends age, gender and even language - leaving you simply blissfully happy for days to come. This 5 piece folk/fusion alternative band incorporates poetic storytelling with different styles of music. Their powerful yet fun performance makes the audience believe they're members of the band itself!